This informative and readable book is aimed at all those who are doing the Helicopter Private Pilot’s Licence course, those who have qualified recently, and those who are planning to learn to fly helicopters in the future. It is based to a large extent on my own experiences, both as a student and instructor, and it covers all aspects of the PPL(H) course. After a general introductory section discussing topics such as how a helicopter flies and the best way to choose a flying school and instructor, the book follows the PPL(H) syllabus as it is taught in the UK, with a detailed account of each flying exercise. The idea is that the student can read about the relevant lesson before he or she attempts it with an instructor. However, this book does not aim to be a textbook as such, or to cover all the precise practical details of the course. Ideally it should be used in conjunction with a helicopter textbook and instructor’s briefings. It tries to look at all the things the student really wants to know, and which he or she might well end up asking a helicopter pilot friend or more advanced student. These include subjects such as why hovering is so difficult, why one spends so long learning to fly accurately, the reasons for going solo fairly early on in the course, why emergencies are practised so extensively, and why students learn how to fly on instruments but are then advised not to do so! It also covers in some detail the human factors aspects of learning to fly, explaining why it can at some stages be difficult, demoralising, and even frightening as well as enjoyable. 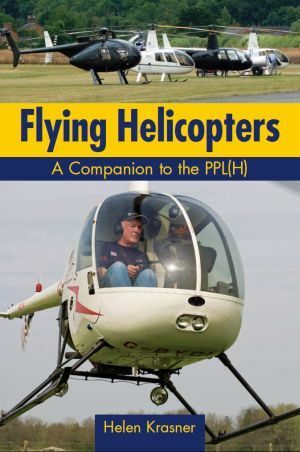 Extensively illustrated throughout, Flying Helicopters: a Companion to the PPL(H) should be a valuable addition to any budding helicopter pilot’s collection. You can buy it here.